The FDA has cleared InPen, Companion Medical’s reusable Bluetooth-enabled smart insulin pen and paired Apple iOS smartphone app. A launch is expected in 2017, likely including Android, too. InPen will track insulin doses automatically and send them to the paired app via Bluetooth. 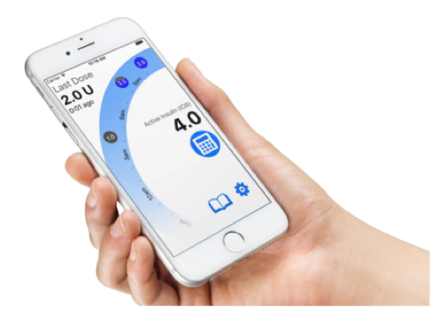 The app also includes a bolus calculator and automatic insulin-on-board tracking, bringing pen and syringe users many of the digital benefits of pumping, but with lower costs and without having to wear a device 24/7. 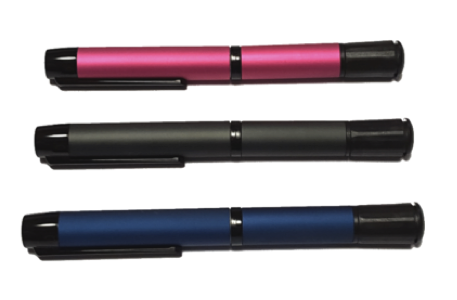 The reusable InPen lasts one year and is cleared for use with Humalog or Novolog insulin cartridges (ages 12 and up). The company hopes the pen will launch with insurance coverage, meaning just one copay per year. Insulin cartridges will be purchased separately from the reusable pen and replaced every week to month, depending on daily insulin use. According to the company, the cartridge change process takes less than a minute. The reusable pen itself has a consumer-friendly design that looks nearly identical to normal pens – it doesn’t have a screen, buttons, or other noticeable add-ons. All the insulin dose tracking happens ‘passively’, and as long as the app is running in the background, it will receive the data (no need to “sync” or download). The app displays last dose and insulin on board, dose history and timing of doses, and even insulin temperature! Data can also be sent to healthcare providers and caregivers. Down the road, Companion Medical hopes to integrate its app with established data management systems such as Diasend, Glooko and Tidepool. Only pumpers currently have access to these services, leaving injectors without an easy way to download their insulin data and view it alongside glucose data. This approval may also open the door to insulin adjustment software that could really help people with diabetes and providers dose this dangerous drug more effectively – e.g., “Change your breakfast insulin:carb ratio from 1 unit:15 grams to 1:10.” Just as artificial pancreas algorithms automatically adjust insulin doses, this technology could enable automatic adjustments to dose calculator settings to improve dosing for pen users. This approval comes as a long-awaited development; insulin tracking for injectors has been a major gap for years. Apart from occasional cartridge changes, the InPen doesn’t seem to add any hassle relative to regular disposable pens. The benefits of finally gathering this data could be significant, and we look forward to seeing how easy InPen is to use and how much it costs.